Mrs. Treva Stoops (above left) and her mother Mrs. Doretha Shipman (above right), residents of the South Shore area, came to the seventh grade Honors English class at Flippin Middle School on December 8 and 9, 1999. They came to tell us the history of sweetnin's in Arkansas. Mrs. Stoops was born on August 27, 1947, and was raised in Mull, Arkansas. Mull is located 14 miles south on Highway 14 past Ralph. 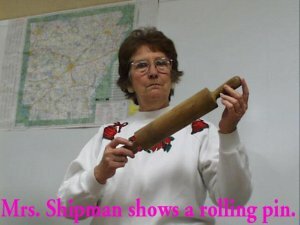 Mrs. Shipman was born on September 15, 1925. Mrs. Stoops grew up during the middle 1900's making and eating sweetnin's. Sweetnin's are butter and sorghum mixed with a fork. The sweetnin' was mixed in a bowl, and, since they didn't have a lot of silverware, they dipped or sopped their biscuits in the sweetnin'. Sometimes, people would put in some jelly or preserves with the butter instead of the sorghum. 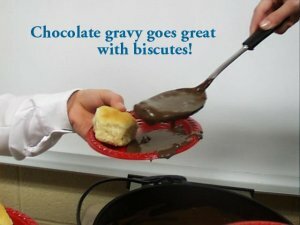 Also, they made chocolate gravy as a sweetnin' for their biscuits. They used some type of sweetnin' at every meal. People made sweetnin's because sugar was so expensive. Also some people had big families, and since they would only go to the store about two or three times a year, they would often run out of sweetnin's. Sweetnin's were popular on the South Shore of Bull Shoals Lake in Arkansas. Bull Shoals Lake is located on the border of Arkansas and Missouri. On January 10th, Kent Coffey, Mrs. Violet Hensley, and Mrs. Shipman helped the seventh grade class choose a song which would fit our research topic. Mrs. Hensley played the violin, Kent Coffey played the guitar, and Mrs. Shipman sang. They sang and danced and gave a lively performance. They sang "Skip to My Lou," "Go Tell Aunt Rhody," "O Susanna," and "Cindy". Mix preceding ingredients thoroughly. Add 1/2 cup water and 1 cup milk. Stir and cook until very warm and thick. You can make this in a cast iron skillet. After taking it off the stove, add a teaspoon of vanilla. 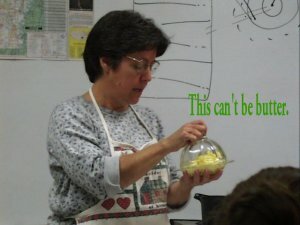 While Mrs. Stoops and Mrs. Shipman were in our class, they made an applesauce cake. 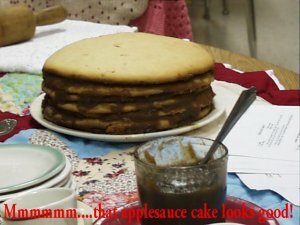 They call this cake, "Over 100 Year Old Applesauce Cake". The recipe has been in the Dillard family for over one hundred years. Mix, cream sugar with shortening, eggs, baking soda, salt, and baking powder. Stir; add milk and vanilla. Sift in flour until very stiff. 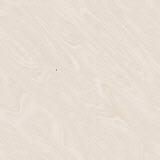 Toss a small amount on dough board and roll out as cookies; cut with an eight inch plate and continue until all dough is used. Bake on large cookie sheet at 350 F. Makes 13-14 cookies. Let cool. Meantime, heat 2 pints applesauce; add 3/4 cup sugar (more or less) on a large plate. Alternate cookies with applesauce until all are used. Mix and boil until syrupy. Make your crust as you would for any cobbler. You may use any pie crust recipe. Put in oven and bake as you do any cobbler. 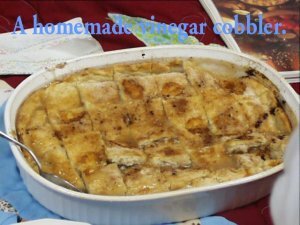 This cobbler is very good in the spring of the year when you have used all of your canned fruit and you are getting a little hungry.